Describing Sergei Eisenstein's 1924 debut feature, Strike, as the "story" of a factory strike that actually took place in 1903, in pre-revolutionary Tsarist Russia, would be like describing his best-known work, The Battleship Potemkin(made the following year) as being about the mutiny of a ship's crew: an accurate description as far as it goes, which is not very far at all, since the experience of viewing an Eisenstein film is much less about the story it is telling than the way the story is being told. For Eisenstein, the style is the substance. Any filmmaker in the ensuing decades who has exploited montage for all of its associative/dissociative properties, its ability to produce a visual rhythm, or just for its sheer dynamism--from Welles to Godard to Kubrick to Tarantino--have been turning pages in a playbook first opened by the great Russian master. 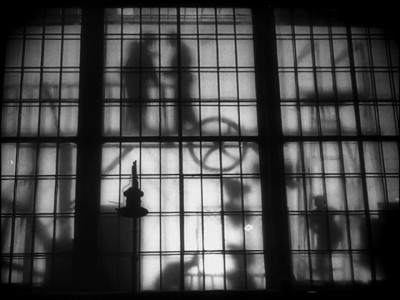 In the Soviet Union of 1924, a filmmaker could not avoid seeing themselves as painting on the vast canvas of history, and in true revolutionary spirit, the hero and main "character" in Strike is not a worker, but The Worker as a class, and Eisenstein approaches this collective "protagonist" not as individuals with distinctive personalities or character attributes, but as a literal mass movement; his ability to capture large groups in motion as they march militantly forward or flee the forces of oppression is impressive, and even one-shots of the workers in action are cut together in such a way that they suggest unity and a common goal. Individuation is reserved for the film's most active villains, a group of two-faced (sometimes literally) spies and minions who hover around the workers' circles and report back to the managers and capitalists on the clandestine organization of a long-overdue strike for higher wages, an eight-hour workday, regulation of minors' working conditions, etc. Through the ingenuity, dedication, and most of all organization of the workers, the strike is initiated regardless of the attempted subterfuge. The bosses' predictably arrogant, bad-faith refusal of the workers' demands results in the strike's indefinite extension and the now-unpaid workers sinking into the scarcity and misery of having no income and no foreseeable prospect of one. Finally, made impatient by the flow of orders they cannot fill, the capitalists join forces with the authorities to infiltrate, discredit, and crush the workers' movement any way they can, culminating in a violent, murderous suppression of the strike that illustrates the inhumanity of human being towards human being when profits are being threatened or obstructed. Eisenstein and his several screenwriting collaborators divide the film into six sections, each focusing on one phase of the strike, from its first stirrings of organization to its final, tragic defeat. Within each of these discrete sequences, Eisenstein is busy at the editing table, constructing delirious, incredibly advanced and creative bits of exposition and action. The aforementioned group of villains, for example, is introduced to us first as a sheet of photographic portraits that comes alive (Amélie may be apolitical, but it knew what to borrow from Eisenstein! ), and then one by one; each has an animal-based code name ("The Fox," "The Owl," etc. 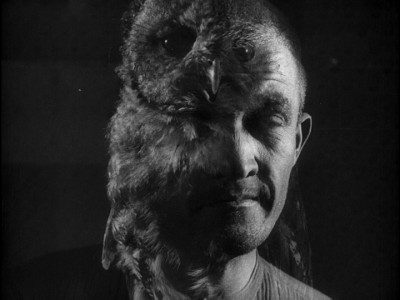 ), and Eisenstein uses a sort of pre-morphing superimposition technique to match footage of each animal with its namesake. At the film's powerful climax, the metaphorical butchery of the workers by the Tsarist authorities is staccato-cut with images of actual butchers at work (a conceit later ripped off in both Nicolas Roeg's Walkabout and Coppola's Apocalypse Now). Strike is packed to bursting with such inventiveness; each new turn of the film's events leaves us breathlessly waiting for whatever ingenious, astonishing way in which Eisenstein will unfold it for us. At the ideological level, Strike is, of course, pure Bolshevik propaganda. Are the maniacally decadent, fat, greedy, cigar-smoking factory owners given any shading of character whatsoever? You had better believe they are not. The film's broadness in this respect, however, is due partly to the exaggeration endemic to silent cinema, and partly to the propagandistic function and mission clearly inseparable from any Soviet conception of cinema circa 1924, in those heady, victorious post-revolutionary, pre-Stalinist days. The bluntness of the film's message may seem crude, but it is adequately compensated for both by our knowledge that it was made to be accessible to and galvanize an impoverished, illiterate population (in this and in many other ways, the film is more "about" 1924 than 1903, the story's time period notwithstanding) and, most of all, from the high-voltage inspiration that, however emphatically telegraphed the film's messages are, sets the current of Eisenstein's filmmaking fever--an obsessive passion for the seemingly limitless possibilities of a medium still in its youth--coursing palpably through every frame. This DVD edition of Strike presents, at the correct 1.33:1 aspect ratio, a new, HD-mastered print of the film that, despite the inevitable instances of noticeable print wear and the technical limitations (flicker, etc.) of a film of this vintage, is strikingly clear and crisp, with all the brilliant cinematographic/montage effects and the rich contrasts of the film's black and white compositions (by a team of cinematographers including Vasili Khvatov, Vladimir Popov, and Eduard Tisse) readily discernible. It is safe to say that the remastering and transfer of Strike for this DVD is an important act of film preservation that has been executed with an admirable degree of conscientiousness and care. Kino has included a traditional Russian music-based score by the Mont Alto Motion Picture Orchestra as sonic accompaniment forStrike. Presented in Dolby 2.0 digital stereo, the sound is rich and forceful, with every instrument and frequency, from the highest to the lowest, coming through as fully, if not more so, than on any classical music CD I have ever heard. --Gulov's Diary, a surreal comic short from 1923 and Eisenstein's first film, created for use in Eisenstein's multimedia stage production of Alexander Ostrovsky's play Enough Stupidity in Every Wise Man. This film, long thought to be lost, would probably make more "sense" in its intended context, but it certainly amuses even if taken just as a series of beautifully staged, shot, and edited bits of clownery. 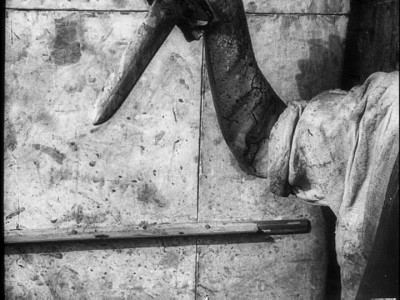 --Eisenstein and the Revolutionary Spirit, an informative half-hour French documentary in which clips from Soviet cinema and an interview with Russian film expert Natacha Laurent evoke the artistic and historical contexts out of which Strike emerged. Impassioned dedication to a cinema rendered dynamic and exuberant through editing and outside-the-box, insouciant creativity is a tradition we may associate with the more immediate reference points of early Godard, Scorsese, and Tarantino than with the silent era, but Strike reminds us (even as it thrills and wows us) that Eisenstein was chartering that lively territory very early on. The film's bluntness and lack of propagandistic sophistication may strike us as transparent as we look back on it, but its understandable adherence to some of the exigencies of its political context and its standard silent-film penchant for exaggeration are easy to look past as Eisenstein's evident joy in the medium makes anything that might have seemed prosaic or facile about the message or story come effectively, urgently alive. Strike demonstrates once again the almost jarring modernity of Eisenstein's cinema, which even a near-century has not diminished. For any member of that unfortunately large group of people who are intimidated by silent film and/or have never actually seen one, Eisenstein in general, and Strike in particular, would be an excellent way to dip one's toes into the water. It is a virtual catalog of pioneering cinematic techniques, but there is nothing academic about it; this is cinema in the process of discovering new ways to give immediate, visceral pleasure, and in this film's case, it is a pleasure that proves absolutely timeless. Highly Recommended.